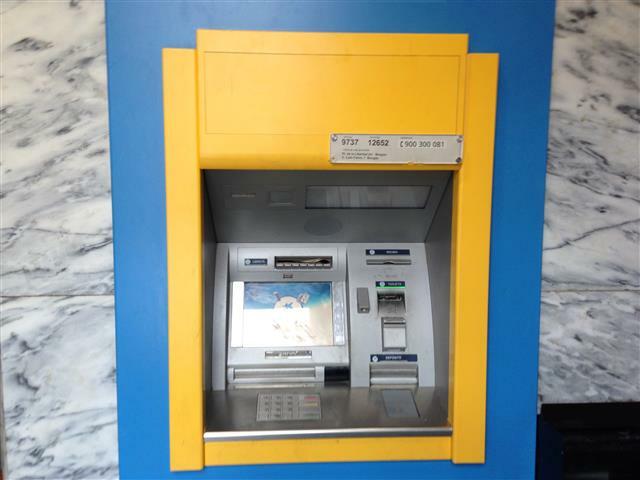 Highlights: Engaging the bank again regarding cash the ATM took. It was great to sleep until 7:30 and not feel the pressure to rush out of town even though I knew it was going to be hot when I left. I packed up and headed to the bank to get cash and then up to the other bank to see what was happening with my money there. All the banks here in Spain open at 8:15 in the morning unlike in the U.S. where they open at 9:00 so I didn’t have to wait but a few minutes to see someone. It was interesting when I went in. I was greeted by two people, and in my best Spanish possible I told them what I wanted and asked for their help. They referred me to a young lady and right off she started speaking English. This was nice because I was having trouble trying to explain what had happened in the past that has led to now and I just didn’t know how to get from there to here. Finally after about 45 minutes and several phone calls that the lady made for me, she told me that I had to call my bank and have them file a claim with this bank. Well that’s not going to happen until I get back in the states. I can’t take a chance on my bank thinking there’s something wrong with my ATM card and cutting it off. This would leave me with no access. I will see what I can do when I get home, as the lady gave me enough info to give my bank, but I really think that this is just an expensive lesson in choosing which bank ATMs to use in the future. Anyway I left town at 8:45 heading toward Calzadilla de la Condes. There was no place along the way to stop and get anything so I just pushed on. It was much like yesterday with the fields on both sides of the path. Today I saw a lot of folks on the trail so I had plenty of opportunity to have conversations along the way. I talked with a woman from Australia for a while. She was a professional photographer who traveled around the world shooting pictures of local areas. She went down to Cuba and did a photo shoot for some relief organization out of New Jersey. I then moved on and did the last couple of kilometers alone and got to the hostel to check in. This little village is in the middle of nowhere and the only thing they have is an albergue and a hostel with a restaurant. It is really nice and is reasonably priced. This is an interesting little village in that even though it is in the middle of nowhere and you only see a few older people, they still have a playground with swings and slides and things that little kids would play on. Like most of Spain, you will see cats everywhere and this town is no exception. I must have seen six or seven cats coming down Main Street. 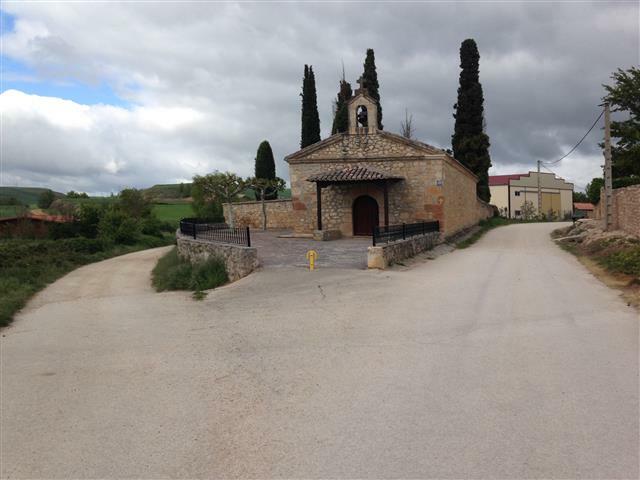 This village has the Calle Mayor which is the main street and the side street that goes to the Hostal Camino Real and that’s it. They don’t run but about a tenth of a mile at best. There has been a lot of activity here at the Hostal/Restaurant, but most of the people have either moved on or gone back up to the albergue. I guess I’ll see a lot of folks around 7:00 as that’s when the Peregrino menu is offered. 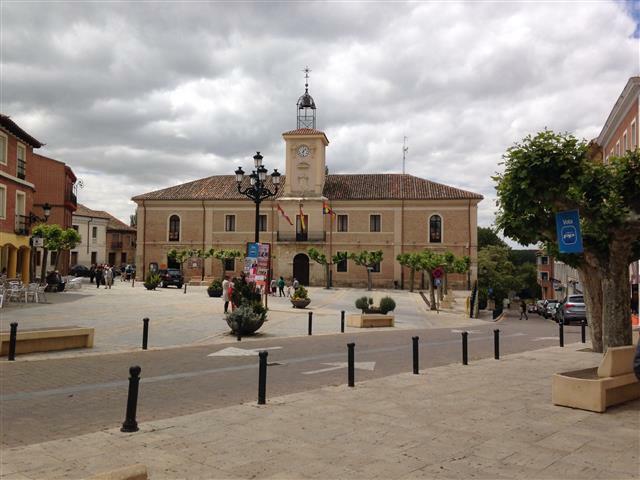 One of the nice things about here is that they take a credit card and I can hold on to the cash that I have because in the Meseta a lot of places don’t take anything but cash and have no cash machines. I met up with the Brits that I met yesterday and we chatted while they had a glass of wine and we agreed to meet back up for dinner around seven. They are an interesting sort, very conservative and well travelled. They asked me if I had ever been back to Vietnam since I left in 72. When I said no they started telling me all about it and how it had changed since then. They said that there are some tour boats going up and down the Me Cong River. It sounded nice, but don’t think I want to go back. Been there, done that and I have the merit badges for it. Because this is the only restaurant in the village, the dinner was like a giant communal meal. I was able to see a lot of the folks that I’ve been walking with for the past few days. The meal was exceptional. Tonight I had a large salad and a quarter of a chicken with fried potatoes, and chocolate cake for desert with wine and water to drink. The meals are getting better with each passing day. On the subject of injuries, I’m seeing so many people that are hurt, bad feet, knee problems or back problems. There are a lot of folks that are carrying packs weighing 25 pounds and up. I talked to a man yesterday and he has three changes of clothes and a c-pap machine for at night, plus a spare battery. The battery alone is probably three pounds. I think that people should take time to do a little more research before taking this walk. I realize that anything can happen on a long walk, but you can do things to minimize the problems. My foot problem probably couldn’t have been avoided due to the heat, but my problem was nothing compared to a lot of others. One fellow that I talked to said that because of that heat wave he took a hotel for several day, until it passed, and he was the one with the C-pap machine. The heat is starting to come back but we’re just about finished with the Meseta so we should see some relief after Leon. Even though it will be hot, we will have more places to take breaks. Wow, it’s hard to believe I’ve been out here for three weeks (21 days). Time is really starting to fly by. It won’t be long before I’ve reached the half way point to Santiago, then it’s a down hill count to the end. Fortunately, when I get to Santiago I will still have time enough to go to the Atlantic and back. But at this point I’m just taking it one day at a time and enjoying the walk and the people that I meet along the way. It is with that I will close for tonight and get ready for any new adventure that comes my way tomorrow…Buen Camino! Mileage: 19.3 km Weather: Beautiful blue skies without a cloud in the sky. The wind had died down a great deal and it was a little warmer to start the day. Temperature: 46° F at 6:15 a.m. Highlights: There was nothing remarkable today. It was a good day and it was pretty just being here and being able to walk, but nothing exceptional. All path walking was near a highway that had little traffic on it and green fields on both sides. I got up at 5:45 this morning and packed for a relatively easy and somewhat shorter walk. Unlike most mornings when I leave there is only me and I don’t see a soul, but today was different. When I walked out I saw four people walking up from behind me, and I saw one person going over the hill in front. I guess with the warmer weather people are venturing out a little earlier than before. I prefer to start early no matter the weather. I get a jump on the day and finish earlier so I have plenty of time to walk around town, talk to people and take pictures. I do think that I’m in a lull with the people out here because I see very few people during the day, and most of the ones that I do see don’t speak a lick of English and not much Spanish. I’m starting to see more French and Italian and most of the time they don’t say anything or they burst into full blown French or Italian and I don’t have a clue what they say. The Asians are different. They may not speak any English but they always smile and just say "Buen Camino." When I left Fromista and started walking it was a path that runs along side a major highway, but there wasn’t much traffic on it. It was kind of boring. The most interesting part of the day was the bridge over El Rio Ucieza (the river Ucieza) which was one of those old stone bridges. 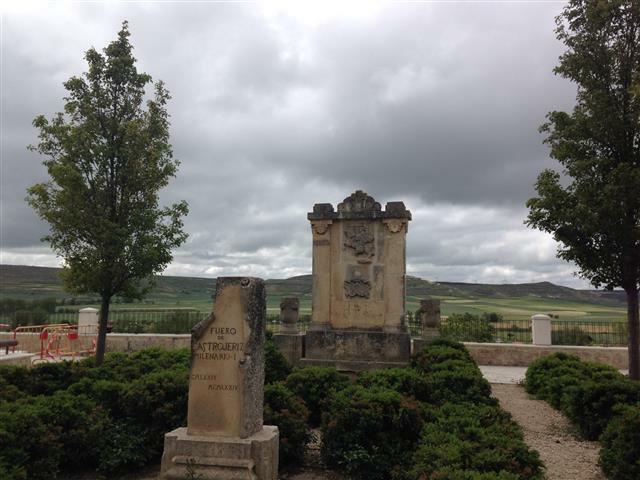 There were only two places to stop the entire day and I stopped at both for a café con leche, one was a little bar in Poblacion de Campos and the other was in Vallalcazar de Sirga, and there was no one in either place. I just walked a steady pace and by 10:45 I was at the hostel that I was going to stay in. Later I went down to the restaurant that serves a Peregrino meal for 11€, which is a pretty good deal considering that you get a full three-course meal. I tried something completely different tonight. I promised someone back home, and she knows who she is, that I was going to try new things this time. The last time I wouldn’t even consider it. I had a Russian salad which has carrots, onions, peppers, and bits of boiled potatoes all chopped finely and blended together like a chicken salad with what I think was mayo and all was on a bed of lettuce. For the main meal, a chicken dish of thinly sliced chicken and battered in a lot of different herbs and spices then fried, and again with the fried potatoes (not). And for the desert ice cream, not the flan, which I like. Well I tried it. After that I walked around town for a while. Even though the walk today wasn’t overly exciting with much new stuff to see, it was a great day for a walk of any kind, and the town was enjoyable to see so it was another good day, and I’m glad to be here. 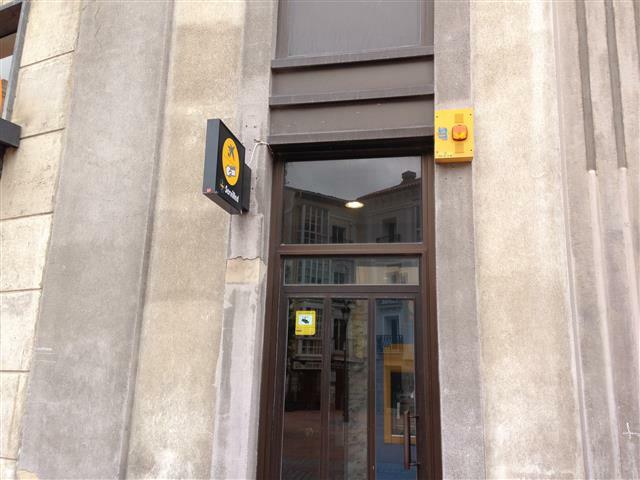 One other thing, I found a branch of the bank that shorted me on the ATM in Burgos and then said they would put the cash back into the account. They are here in town, so tomorrow I will pay them a visit and see where we are one that front. It will be another test of my Spanish banking terminology. I’ll let you know how that turns out. Well that’s about all the news for today, so until tomorrow I will say Buen Camino. Weather: Beautiful weather with blue skies and light white puffy clouds, and still very cold. 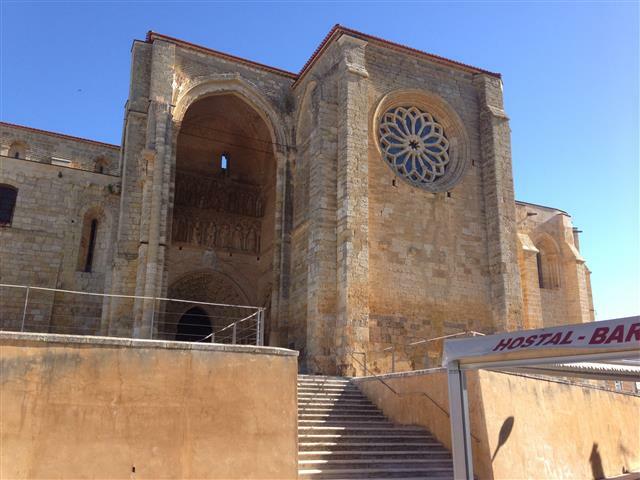 Highlights: Being back up high on the Meseta after climbing up to the summit Alto de Mostelares and walking along the Canal de Castilla, seeing the Gothic Church, Iglesia de San Pedro XV. I woke up this morning at the usual time, in the usual way, buried under a pile of blankets as there is never any heat in the rooms. It’s a funny thing about the way they deal with heat. They have all these steam radiators but the don’t/won’t turn them on until late in the day or early in the evening and only for a short while and they barely get the room warm. Most of the time I never feel any heat at all, hence the blankets. Well I got to moving and was packed in pretty short order and out the front door of the hotel. It was barely light enough to see so I had my head light out and in the ready position. Getting out of towns has always been a little bit of a challenge for me and today was no exception. I know it seems crazy when most of these little towns usually only have two or possibly three streets going the way that you know the trail runs, but I can find a way to pick the wrong one a lot of the time. I finally got out of town and was headed back up into the mountains and started climbing to the summit of Alto de Mostelares. This was a 900 meter summit and was a 12 percent grade going up, but the down on the other side was worse as it was an 18 percent downhill grade. After that is was pretty much level all the way to Fromista. I have been keeping an eye on the feet and the new shoes and, knock on wood, they both appear to be doing fine. I made it to the little village of Itero de la Vega, population 190’ and saw an Albergue/Restaurant and it was open so I decided to stop in for a café con leche and something to eat. The café was good but unfortunately there wasn’t any kind of breakfast items that interested me so I drank up and moved on, thinking that maybe just up the street a little ways there would be another restaurant, but I guess that I over estimated the spirit of competition in a town of 190. Anyway I was good for a while. I pushed on toward Fromista. 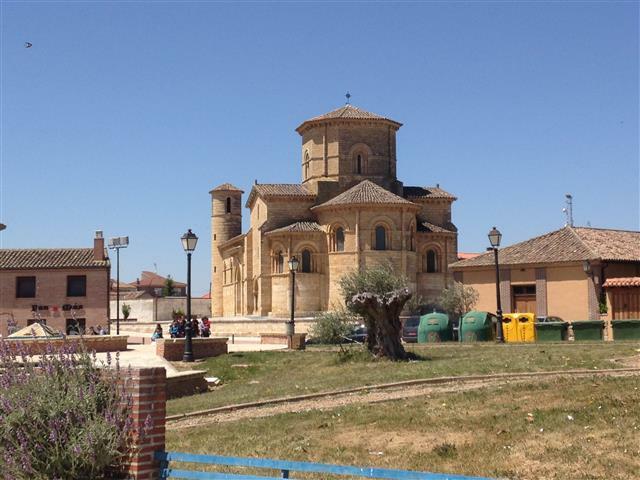 There are tons of churches along the Camino and the very next town of Boadilla del Camino, population 160 has the parish Church of Santa Maria. It’s a 16th Century church and while it was locked and I couldn’t get in this time, like two years ago, it has an extremely large stone baptismal font which is very impressive although I can’t understand why they would have needed something that large especially back in the 16th Century. Right after leaving town the trail starts a moderate climb up to the canal. 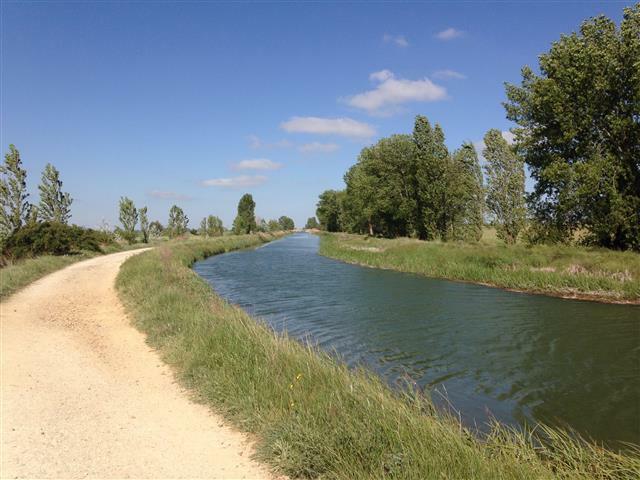 It is called the Canal de Castilla. It flows all the way to Fromista. This canal was originally designed back in the 18th century for both irrigation as well as transporting crops down stream for delivery to the marketplace and also for turning the corn mills, a lot like the farmers did in the Southern U.S. during the 1800s with their grist mills. I followed it all way to Fromista where you cross the canal on a little bridge at the lock on the canal. After crossing the canal I went down to the street and walked to my hostel to check in and get cleaned up. It was enjoyable walking along and above the canal as I saw a lot of different kinds of birds and other little creatures. When I found where I was staying I went in to register. A nice little lady greeted me and checked me off the list then took me to my room. It is a single room with a twin bed, a small table with two chairs and a bathroom laboratory, but nothing else for the bathroom. She told me that I would be sharing that with two other people in the next two rooms. It didn’t matter to me because I generally get in about two hours before anyone else so I was able to shower and get cleaned up long before anyone was even close. After I got all that done I started planning my tomorrow and where I wanted to stay. When I get that figured out I always ask the people in the lodging/reception area to please call and make my reservation for the next day. I did it this way because I could speak Spanish at my pace and know that I would understand what they were saying to me and that I wouldn’t mess up my reservation. I went and asked this little lady, which I later found out that she was 88 years old, if she would call this place… and her reply to me at the highest rate of speed in Spanish was "yo no mama" and then she went on to tell me that she didn’t call. I asked her in Spanish to slow down and then I aksed, "You won’t call?" What I got out of the first thing that she said was "I’m not your mama and I don’t call for reservations." I just told her "thank you," shook my head and went to find something to eat. It really threw me off. I wondered if I misunderstand what she said or if she felt like it wasn’t her job to do that. Anyway after about an hour I came back to the room and when I came in there was another woman there and she was about 45 or so and before I could even say hello she ask if my name was Scott and did I want her to make my reservation for tomorrow now? Then I got it. The little lady was telling me that she was the mother of the woman that ran the place and that she didn’t make phone calls, but her daughter did. There’s nothing like hearing a joke and walking away only to get the punch line 20 minutes later. That’s what this felt like. Anyway she called and got me set up for tomorrow. A little later I ran into a fellow that I had met a back in Castrojeriz and we sat and talked for a while. He asked me if I wanted to go and have dinner so I accepted. We met up with a few of his friends that he had met earlier and we all had a nice dinner and conversation. Wolfgang was a German fellow and he has everyday documented to the hour. He planned each day as to where he is staying and how far he is going to walk. The other couple I'd met was from Australia. After dinner we all headed back to our own rooms to get ready for bed and another day on the Camino. So at this point I will do likewise go to bed, so I will be ready at 5:00 in the morning. Until tomorrow… Buen Camino! 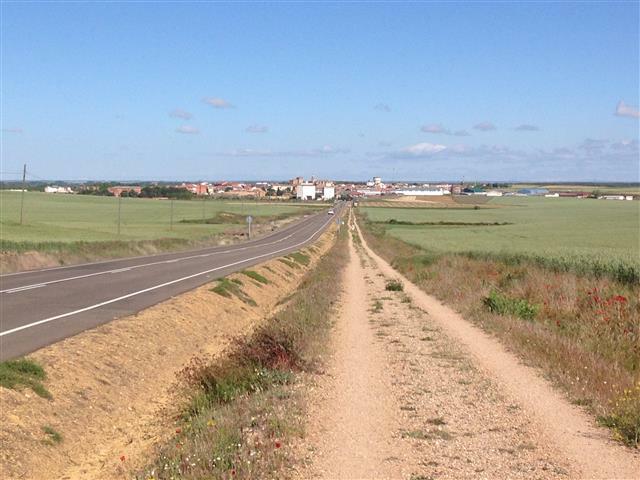 Highlights: Reaching the highest point on the Meseta and getting a clear 360° view from horizon to horizon as the sun breaks across the horizon. The ruins of the 14th Century convent of San Anton. I slept soundly right up until my alarm woke me this morning at 5:45. This is one of the best night's sleep that I’ve had since being on the Camino. Actually nothing hurt, no back pain and especially NO FOOT PAIN, which was truly a blessing. 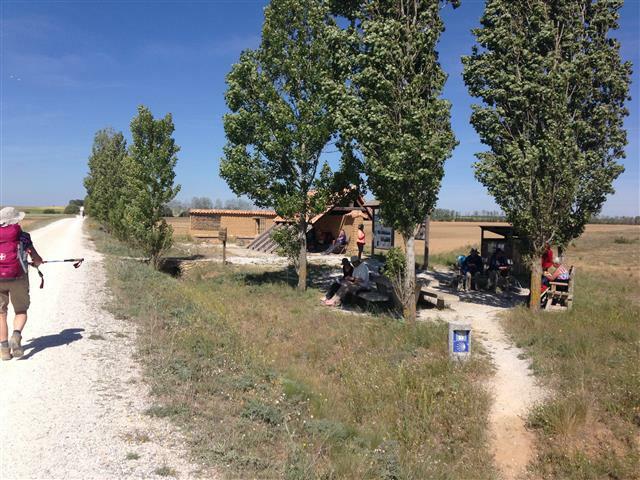 When I left Burgos in the new shoes I was cautiously hopeful that they were going to solve my problem and that all I had to do was heal the past, and now after walking nearly 50 kms in the past two days I’m going to slide out on a limb and say I believe it’s getting better. Anyway I walked out of the Pension just as it was light enough to see without my headlamp. 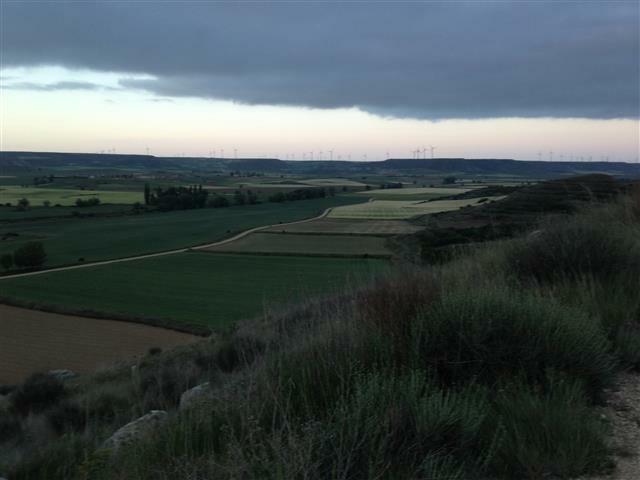 It was 36° and a strong wind blowing so it was plenty cold and I was about to climb to the highest point on the Meseta with no way to block the winds. I think that I was the only one out this morning, as I walked for at least an hour or more and saw no sign of people in front of me or behind me. It’s been that way ever since the weather has turned cold, everybody is starting later. I still like to start early and finish by noon so that I have plenty of time to check out the towns, talk with the local fare, and just do nothing. 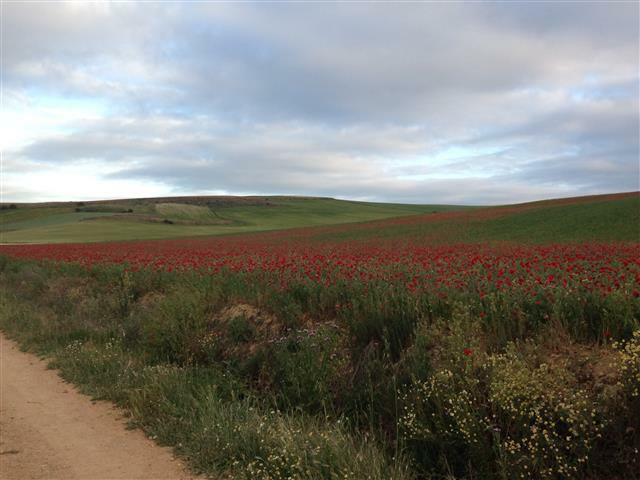 The Meseta is so pretty, there is a lot of green everywhere and the views are forever. Spain is real big on wind generation and from up on the desert you can in some places look 360° and see large windmills turning away. This in a way reminds me of the PCT, when you go through the “wind farms” in the Southern California desert, but our deserts aren’t green like these. After about two hours or so I came into the little village (pueblo) of Hontanas and there was a Bar/Café open so I made a made dash there to get a café con leche. I don’t drink much coffee at home, but the café con leche here is really addicting, not to mention if you drink a cup of it you don’t have to walk, it will carry you. It’s strong but not bitter. After about a thirty minute break I took back off. I’m now seeing some folks on the trail, which is nice to see. I caught up with and walked with a nice Australian woman, who by my thoughts is still a young lady, as she looked to be about 23 years old. It always amazes me the age variances on this trail. I have seen folks as young as early teens with their parents up to people in their 80s and every language that you can imagine. At this point I believe the most spoken language I’ve heard is Spanish (and not necessarily from Spain), but a close second is either Italian or German. English is really farther down the list. But anyway she and I walked along and talked and as quickly as we came together we separated and were out of sight of one another. It’s that way on all trails, but here it seems to happen more quickly as people will walk for maybe 30 minutes together and then they split and are alone again. 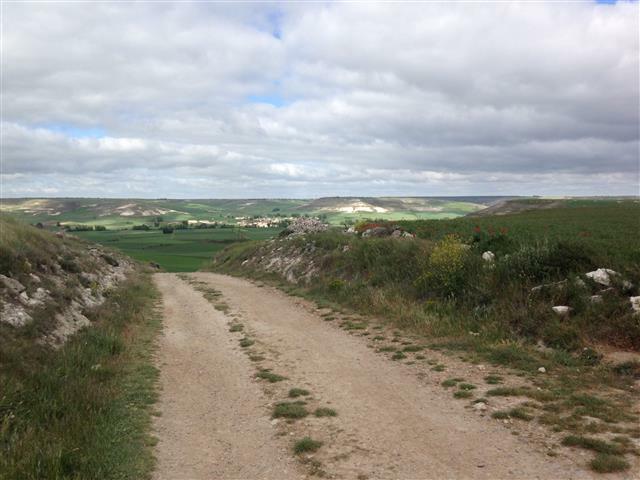 In my opinion the Camino tends to be a more introspective walk. I find myself reflecting on what I’ve done in the past and what I want to do in the future and have uninterrupted time during the walk for that, then when you come into the towns at night you share a meal with complete strangers and in a way celebrate the day’s journey. It wasn’t too long before I started to drop down off the high point and started to follow a road. In the distance I noticed what looked like a falling down building. 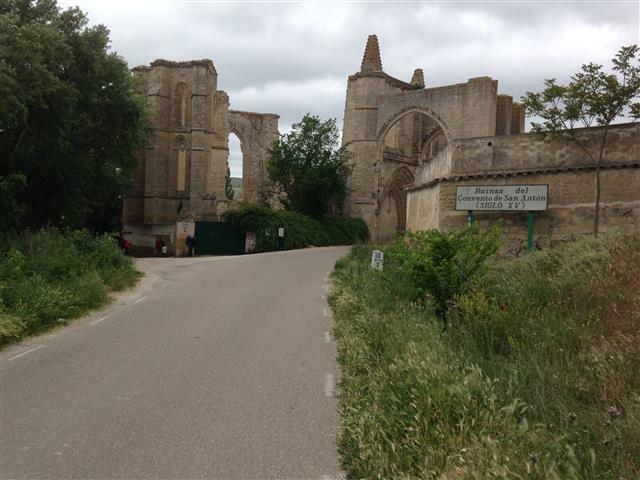 It was the ruins of the 14th Century convent of San Anton. It was interesting to see, as the archway to the convent extended out over the road and cars would drive right through it. 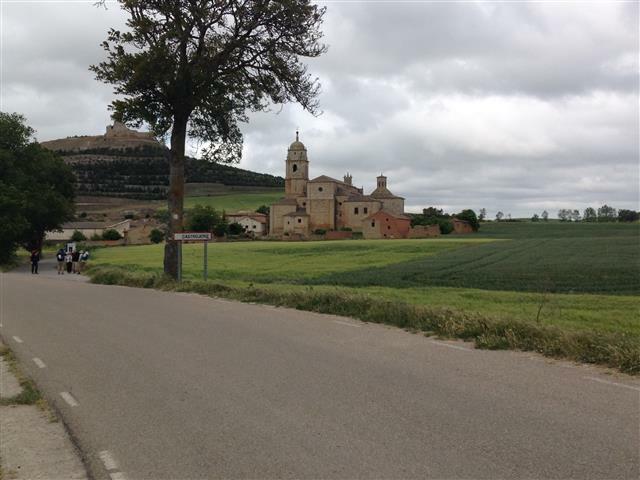 After spending a little time looking around and taking pictures I moved on up the road because I knew that I was getting closer to the small town of Castrojeriz and I wanted to get into my room and clean up and eat. When I finally found the albergue with the room it had a sign posted on I that said they didn’t open until 1:00 p.m. Well I knew that albergues usually didn’t open until 1:00 or 2:00, but I thought that people with rooms could go right in, I guess I was wrong. I decided to go on down to the place that I stayed two years ago and check it out. When I got to the Hotel Iacobus I went in and a man was coming up from down stairs. I asked him if he had any rooms, and his only reply as he walked pass was “un momento.” In about two minutes he comes back and hands me a key and says in Spanish, room 112 and walks away. He didn’t ask for ID or money or anything. I went up to my room and they were just finishing cleaning it. It was great. I unpacked and got cleaned up and then decided to go down to the restaurant on the lower level and get something to eat. When I got there the same man was there. I later found out that he owned the hotel. I told him that I needed to register and pay for my room, and again being a man of few words says to me’ “ mañana” and then wants to know what I wanted to eat. In America they don’t care what you want as long as you give them the money first. I later ran into a woman that I had met about a week ago back near Pamplona and we talked for a while and then decided to have dinner later that evening around 7:00. Later we met at her hotel and went to the restaurant there, and had a glass of wine while waiting to be seated. It turns out that she is a pastor in a church in up state N.Y. The dinner was really good. The first serving was spaghetti instead of salad, but it was good and then the second serving was again with the chicken, but cooked differently than last night. Just didn’t want pork or beef stew. Dinner in Spain is not your typical grab it and growl type dinner, where you finally order and in five minutes they bring it and then you eat and are gone in 15 minutes. Here in Spain eating is an event to be savored and enjoyed with wine and conversation. We sat down at 7:00, and that’s early by Spain's standards, and we didn’t get up from the table until after 9:00. All in all it was good food, and good company and it’s part of the reason for being here. After dinner I walked back to my hotel and prepared to watch about 15 minutes of Spanish television. Tomorrow, I plan to do a 24.9 km walk, but will let the feet make that decision. Right now they feel pretty good. Tomorrow will tell the real story. Speaking of feet, I’m still wearing the pair of Xero camp sandals. I can tell you they are working out pretty well. I don’t walk all day in them but they are the shoes that I go to when I quit walking every day. They appear to be a great walk around town shoe at the end of a long day. They seem to hold up really well. We’ll see on toward the end of the trip. Well, that’s about all the news for today so as usual I’ll bid you a good night and a Buen Camino..
Woke up at 5:00 this morning and was really ready to get out of town. 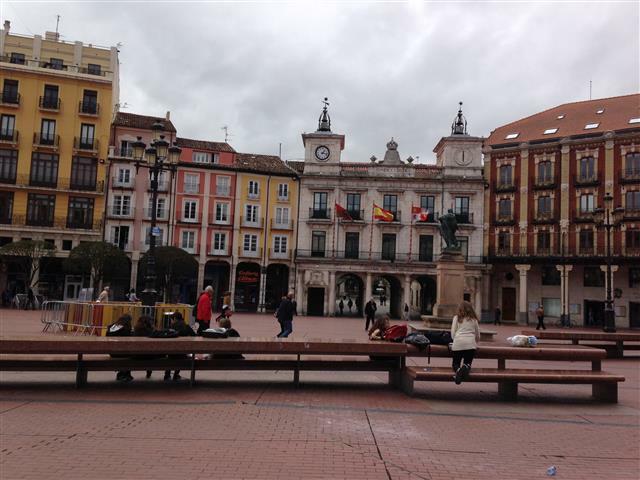 Burgos is a great town, but it was past time to leave, and I just hoped that the new shoes were going to work out for me. I was out of the hotel by 5:45 and heading up the street. The skies looked okay but it was a cold morning. I walked for almost two hours and never saw a single person in front of me or from behind. 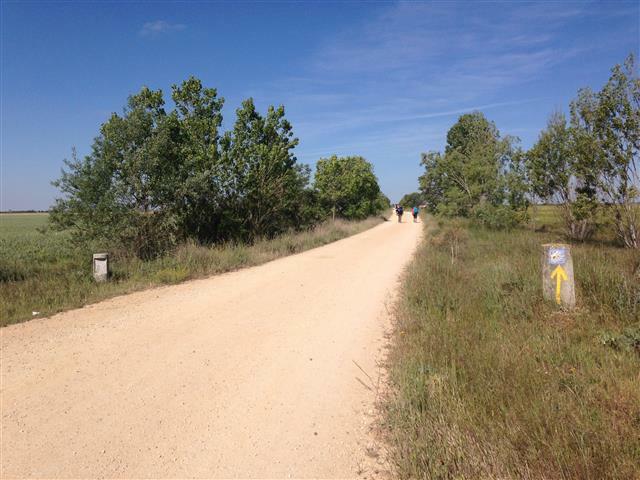 I was beginning to wonder if I was on an alter parallel Camino Trail or not when I saw someone coming up in the distance so I figured everything was fine. And speaking of fine my feet, while a little sore they are doing really great and I have no rubbing or tightness issues to speak of which pleases me greatly. A German fellow by the name of Patrick came up from behind and we walked and talked for a while until we came to a small bar/café in Tardajos, 900 population, a nice sized village by Camino standards, where we stopped and had a breakfast (café con leche, chocolat cresant, and zomo de naranja).Two things about Spain: when you order orange juice, in Spain it’s "zomo de naranja," not "jugo de naranja." "Jugo" is the Latin Spanish pronunciation and secondly always order it zomo de naranja natural, or you might get the bottled OJ. After breakfast we packed up and started the push to the summit of what they call a long climb, it’s 950 meters. I admit it will make you breathe a little harder, but the ones at home are more difficult. I then came up on a woman from Denmark and we chatted all the way to the little village of Hornillos del Camino, where we were staying for the night. There are three albergues here now (and all are booked full) and one pension. When I came through here two years ago there was only one Albergue and it was booked full then. An albergue is a place like a hostel where there are beds lined up one right after the other and you pay for a bed for the night. A lot of people snoring and getting up all times during the night. The other option is a pension. It is a privately owned business, but it could be in someone's home or a condo, or an apartment with a room they rent you which includes your own bathroom, not shared. Some of the pensiones include dinner and most include breakfast. The thing you have to remember about breakfast in Spain is that it really isn’t like breakfast in America. Usually it’s a glass of orange juice, coffee, bread (sometimes toasted most times not) and jelly. They also will give you a slice of a mild white cheese and a couple of pieces of ham (it’s called "jamon York"). It’s like the processed ham we get in packets, but it’s fresh, no packets allowed. 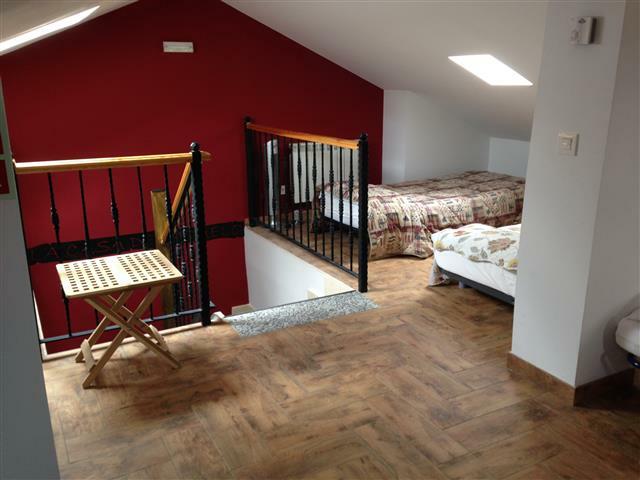 I prefer the pensiones to the albergues because you get the room with a locking door and you can go sightseeing and leave your stuff and not worry about it. You can get up when you want and pack up without disturbing anyone “TRYING” to sleep. One of the things I like in the pensiones is that they have a television in the rooms, not that I like to watch TV, but I get to practice Spanish and Spanish TV is sometimes pretty funny to down right slap-stick. 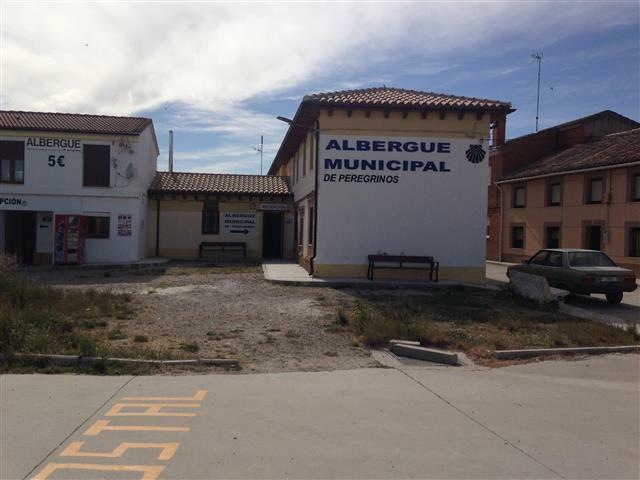 The other main difference between the albergues and the pensiones is the price. Most albergues cost between 5€ and 15€ and the pensiones usually run between 25€ and 45€ a night, but with the breakfast included which can be as much as 4€ and 7€ if you buy it on the street in the Bar/Café. Most of both of them are clean and neat, but you have to be a little more careful in the albergues as they have a greater chance of having bed bugs. I’ve stayed in some really great albergues. Speaking about pricing and food here in Spain, it’s a lot different form going to a restaurant in the States. All meals in the restaurants are served in three courses. You get a "primero," which is the appetizer and you generally have about four things to choose from: mixed salad, pasta with tomato sauce, fruit salad or some other veggie platter, then the "segundo," which is your main dish: a chicken dish, pork dish, steak or some type of fish dish. All dishes are served with potatoes, they call them french fries, but believe me they aren’t like our French fries. Usually they are in the bottom of the plate and the meat dish is sitting on top of it and is a little soggy, but I have to admit it is great. Finally the "postre" is served. This is the dessert and again they give you a number of choices. Also you are given a choice for your drink, wine or water, and this is a full bottle of either, but not both. You can choose on the wine red, or white. You also get a basket of bread. Tonight I had a mixed salad, ¼ Chicken sautéd in an ale sauce with potatoes, and for dessert I had a caramel flan, which was great. One thing to know about eating in Spain and that is the portions are large. You will never go away hungry. The thing that’s the most amazing is that this costs anywhere from 9€ to about 12€. Dinner is always late in Spain, not like us eating around 5:00, that's when they are sitting in the restaurants having wine and tapas and visiting with friends. Dinner usually starts about 8:30 to 9:00, unless you are a Peregrino, (Pilgrim) on the Camino de Santiago then you can generally find the Peregrino menu and eat about 7:00 to 7:30. This has been an exceptional day and my feet feel better, so tomorrow should be even better. It’s close to 10:00 and starting to get dark and time for bed, so until tomorrow I will bid you a good night and a Buen Camino! Well the day started off pretty grim as my feet were still badly swollen and it was all I could do to get my shoes on. I have tried soaking them and elevating them but they just wouldn’t go down. I finally got them on and checked out of the hotel and started walking up the trail, but the pain seemed to increase with every step, so I just turned around and walked back to the hotel. I decided during the walk back I only had two choices; neither were good, but either stop the walk or get new shoes as these now are just too small. Just like my feet were on the Pacific Crest Trail in the desert, I knew they weren’t going to go back to the normal size as long as I kept walking, so I got new shoes and continued. The same for this trip; I found a sports shoe shop and started the long and laborious task of trying to find a pair that not only I liked and the quality was good, but fit right. I guess I spent at least an hour trying different pairs on and also different sizes. The sales people just stood there and watched as I did the things that needed to be done to make sure they are long enough and wide enough and that the arch broke in the right place for your foot. Finally, I found a pair of Salomon’s that worked pretty well. I know the Salomon name and they make a good quality shoe. I just hope they work out for me. Now I get to wear a pair and carry a pair, because I’m not going to throw away an almost new pair of shoes that I know I can wear again on the Appalachian Trail at a later date. (Post Camino Swelling). 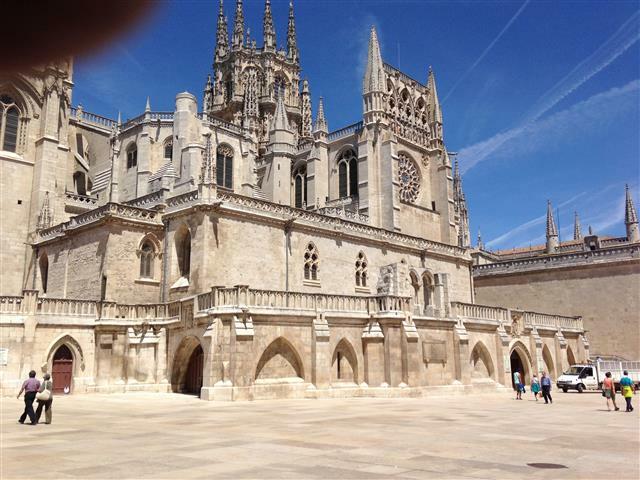 I can tell you for certain I won’t ever be forgetting Burgos as it is the budget buster for the Camino walk 2015. Another thing I think that I’ve seen just about everything here. Boredom is really setting in. After I finished with the shoe enterprise, it was time to deal with the bank on my ATM mess. I found out where the bank was and walked to it , in my new Salomons, to see about getting my money back that their machine didn’t give me. When I went in security approached me about how they could help me. It went pretty well as I knew what I wanted, just not who to see. The man took me to another man that said he could help me. I was working my Spanish for all it was worth and a number of time we both just stood there looking at each other not knowing what the other had just said. One thing that helped me the most was Teresa in the hotel yesterday, as she had explained the entire problem to them and had them document it and them give me a reference number. Finally after they had made copies of both my ATM card and the receipts that the machine spit out (three of them), they told me that it would be about 3 to 4 days, but they would put the money back into my account, even after telling me yesterday that they couldn’t. I guess when I told them that I was a Peregrino on the Camino and wouldn’t be here they decided that they could do it after all. I was perfectly happy with that arrangement, but now there is another task that my daughter has to deal with to make sure it gets back in the account. If they don’t do it, then when I get to Leon, we’ll play this game again. I can truthfully say that I’ve learned my lesson on ATM’s, and that’s to keep looking for a machine that is in a bank (that is open), and not just a stand alone ATM. So with all the housekeeping work done it was time to get down to eating and then getting things packed up again for an early departure tomorrow. I guess in the scheme of things the day wasn’t so back. I still have plenty of time to complete my trip. I got a couple of days of rest, which I probably needed anyway, and I got to spend time in a really great city, but I’m ready to leave. So with that I will continue my walk and say… Buen Camino. Decided to take the day off due to the feet. They are getting better, but are still pretty swollen and think that one more day off of them will help with that. I moved from the other Hotel to this one as the other was too pricey. It was okay for one night as a special treat, but not for two. Besides other than being a little smaller room and not right at the cathedral, it’s just as nice. I am thankful that I have studied my Spanish before coming back to Spain, as I had an issue with an ATM machine today. I requested some cash out and it shorted me 50€. I was able to write down all the information on the machine and the phone number to call, but was worried that I wouldn’t be able to get my point across on the phone so I went back to my hotel and was able to explain the problem to the desk clerk and I ask her to call the bank for me. She did and within 15 minutes they said that they would give me back the 50€, and that they have been having problems with the machine. They could not put it back in my account, but that I could come over to the bank and get it. The problem with that is I’m leaving in the morning and it would be several days before they can check the machine. I told them that I couldn’t stay so they said that when I get to Leon just go to the bank and give them the reference number they gave me from the phone call, and they would give me my money. After that I just walked around the town for a little bit and then went to dinner. I’m now in the room starting to pack up for my 20 km (I hope) day tomorrow. For the most part today has been nice, although when you’re used to moving everyday and not sitting still for more than a half a day, you tend to get a little restless, and that’s what I am now. 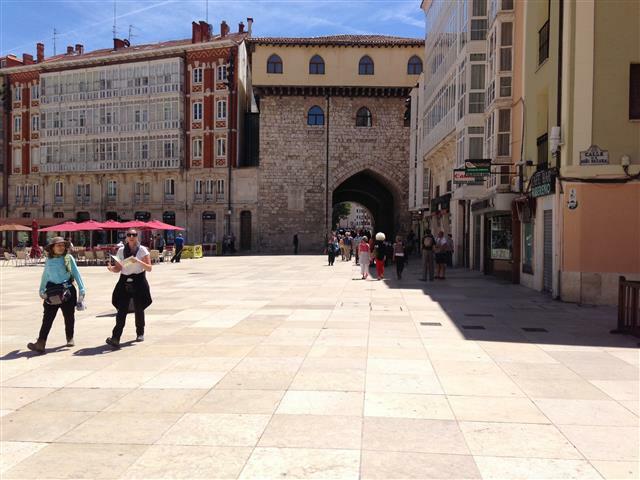 I look forward to leaving Burgos. It’s a pretty town but I’ve done it all. So I guess I’ll finish my packing and work on my feet a little… So Buen Camino!